Yes, growth is not a relationship destroyer— usually. It does become a problem when one partner outgrows the other. Growth should never be a problem, but let’s be honest, many of us stop doing anything extra in the relationship besides the work schedule, the sports schedule, cooking, going out and the other mundane habits we have incorporated in our lives. This is the start of stagnation. 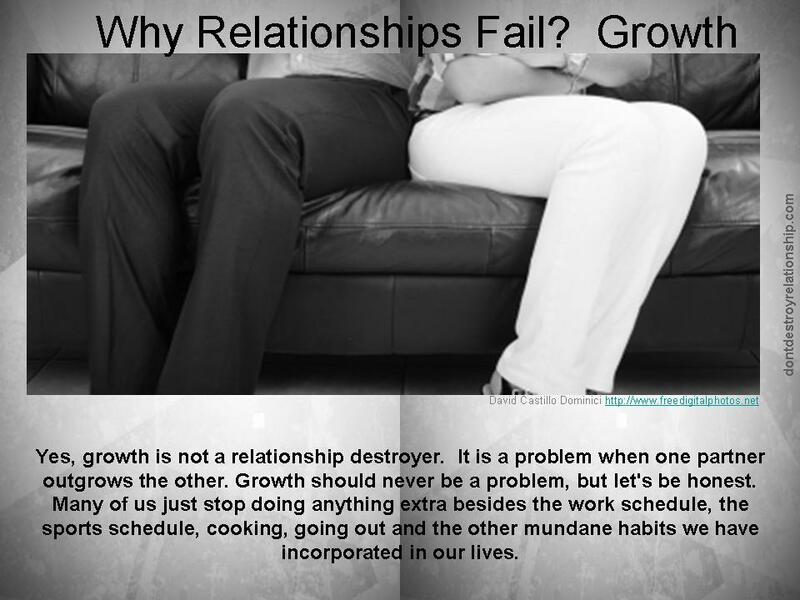 One of the reasons for being in a relationship is to grow. Together. If growth is (not) happening on behalf of both partners, this may not be a problem. Both partners are doing the same thing. However, if one partner is on the path of growth and the other partner is on the path of stagnation, there will be some growing differences. Growth, when not embraced by both partners will eventually cause a breaking away due to a shift in the social, intellectual, mental, emotional and maybe even physical change of the growing partner. Instead of sharing commonalities, the growing partner will make changes, thus causing a shift. This will be perceived by the other partner as a rift. The unchanging partner is often the first to identify this. This is because stagnation always recognizes and resents change, because it disrupts normalcy of the boring habituality. Anytime anyone changes, it is glaringly noticeable, regardless of how subtle the change may be. The same conversations shared in that relationship, will shift, due to one partner having a change in thought, bringing a new idea to share, or using a different approach. The unchanging partner may begin to observe new people coming to the house or unrecognizable callers on the phone, due to a change in the social cycle. New people introductions to the unchanging partner may be a bit uncomfortable, due to unfamiliarity. Sometimes growth will cause a change in reading habits, health and diet, and sometimes even religion or spirituality. The same habits both partners shared are now becoming differences. Growth can come from a change in jobs or careers. A new job comes with a little more income or a link to a better opportunity. This may result in different hours and timing of when the partner is usually home. If both partners usually dine together at 7pm and the changing partner is now coming home at 9pm, this will be yet, another change that will increase the hidden feelings of separation with the unchanging partner. Change is not one dimensional; as one change creates layers of change. This could be overwhelming. If the unchanging partner does not embrace change, is not supportive or will not become a part of the new things and people in his/her partner’s changing life, the feeling of being left behind is unavoidable. These feelings will fester. During a conversation, the unchanged partner will most likely fail to admit his/her true feelings because of the vulnerability that is felt. Instead he/she may find ways to demean or discourage the changed partner, or find a reason to start an argument, maybe even become competitive. Or he/she may brood in moments of uncomfortable silence. This will cause frustration, and of course, further separation. This action will cause the changing partner to seek validation from someone outside of the relationship. Rather than understand the feelings of the unchanged partner, due to a lack of honest communication, the changed partner will feel the unchanged partner is harboring feelings of jealousy, insecurity and maybe even resentment. The relationship will flow better when both partners grow together. 2 Responses to Why Relationships Fail? Growth! You are describing my situation exactly. Thank you for this post. It helps me to understand the dynamics. Thank you for reading! Always honored to help out.